Breadon had been wheeling and dealing, but was not yet tipping his “Cards.” He soon let the media in on the monetary details of an agreement with Browns owner Phil Ball to lease Sportsman’s Park.3 Subsequently, the July 1 publication of “The Base Ball Paper of the World” reversed its previous week’s concern and touted Breadon as a genius for his coup in the venue switch.4 This edition came out on the same date that the Redbirds hosted the Pittsburgh Pirates in their first game at Sportsman’s Park, which was viewed by an overflow gathering in the annual benefit game for the St. Louis Tuberculosis Society.5 All seemed perfect, except for the final score of Pirates 6, Cardinals 2, in 10 innings. Cardinals skipper Branch Rickey tabbed 6-foot right-hander Bill Doak, who was coming off a bout with ptomaine poisoning.9 “Spittin’ Bill” was 8-7, with a 3.57 ERA, as he neared the halfway mark of his ninth major-league season. Rickey had to order his regular first baseman, Jack Fournier, to the bench due to a lingering hand injury.10 Utilityman Hal Janvrin played first and batted leadoff for St. Louis. Janvrin had not played a full game at first in over four years. With a three-run lead, Doak went after the complete-game conquest. A one-out double to right-center by Caton, followed by Grimm’s infield hit brought the tying run to the plate. But Doak prevailed for his ninth win by getting a force out and a routine fly ball to center field,25 securing his shutout and giving the St. Louis Cardinals their first regular-season victory at the intersection of Grand and Dodier. In addition to the sources cited in the Notes, the author also accessed Retrosheet.org, Baseball-Reference.com, SABR.org/bioproject, and The Sporting News archive via Paper of Record. Additional websites accessed were newspapers.com and stltoday.com. 1 Rob Rains, The St. Louis Cardinals, The 100th Anniversary History (New York: St. Martin’s Press, 1992), 30. 2 “Babe Draws Crowd but Ping Does Work,” The Sporting News, June 24, 1920: 1. 4 “Cards Sure Move to a Place in the Sun,” The Sporting News, July 1, 1920: 1. 5 Robert L. Tiemann, Cardinal Classics: Outstanding Games From Each of the St. Louis Baseball Club’s 100 Seasons, 1882-1981 (St. Louis: Baseball Histories, Inc., 1982), 100. 6 St. Louis Post-Dispatch, July 2, 1920: 32. 7 Edward Callary, Place Names of Illinois (Urbana: University of Illinois Press, 135). Gibson was later renamed Gibson City by the US Post Office Department. 8 “Notes of the Game,” Pittsburgh Daily Post, July 3, 1920: 10. 9 Edward F. Balinger, “Doak Has Pirates at Mercy and Cardinals Score Whitewash, 3-0,” Pittsburgh Daily Post, July 3, 1920: 10. 10 “Notes of the Game,” Pittsburgh Daily Post, July 3, 1920: 10. 11 The Sporting News, July 1, 1920: 8. 12 St. Louis Post-Dispatch, July 2, 1920: 22. 13 “Janvrin Is Sent to Initial Sack by Boss Rickey,” St. Louis Post-Dispatch, July 2, 1920: 24. 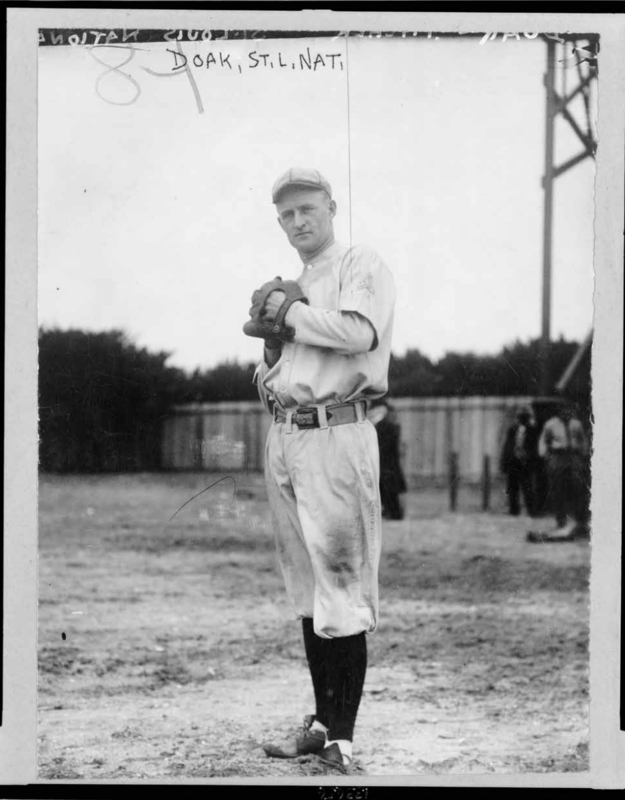 14 Steve Steinberg, “Bill Doak,” SABR Baseball Biography Project, https://sabr.org/bioproj/person/1359e4e2. 15 “Play-by-Play,” Pittsburgh Daily Post, July 3, 1920: 10. 16 “Notes of the Game,” Pittsburgh Daily Post, July 3, 1920: 10. 17 Charles J. Doyle, “Failure to Hit Bill Doak Cost Buccos Hard Battle, 3 to 0,” Pittsburgh Post-Gazette, July 3, 1920: 9. 18 “Play-by-Play,” Pittsburgh Daily Post, July 3, 1920: 10. 19 “Play-by-Play,” Pittsburgh Post-Gazette, July 3, 1920: 9. 21 “Play-by-Play,” Pittsburgh Post-Gazette, July 3, 1920: 9. 22 “Notes of the Game,” Pittsburgh Daily Post, July 3, 1920: 10. 24 “Play-by-Play,” Pittsburgh Post-Gazette, July 3, 1920: 9; James M. Gould, “Cardinals 3, Pittsburg 0,” St. Louis Star, July 2, 1920: 20. 26 Tim O’Neill, “A Look Back – Hodiamont Line Street Car Closed Out After 107 Years of Service,” St. Louis Post-Dispatch, May 23, 2010, stltoday.com.